My local city council member, obeying her party, joins the majority in showing her contempt for the average New York City taxpayer. Why do so few people vote? Why are some many people so cynical about career politicians and their often-self-serving ways? Indeed, why did a recent public opinion poll show the vast majority of New Yorkers convinced that their government was corrupt? An example of this voter apathy and disgust, this citizen weltschmerz, was on display recently in lower Manhattan. That’s when the New York City Council—including my-pol-for-life city councilwoman Karen Koslowitz —ignored the findings of a pay commission and quickly voted itself a fatter pay increase. I say quickly because the 51-person council, with only seven negative votes, approved a 32 percent pay increase. (Council pay went from $112,500 to $148,500). The council also decided it would only hold one public hearing on the pay increase. 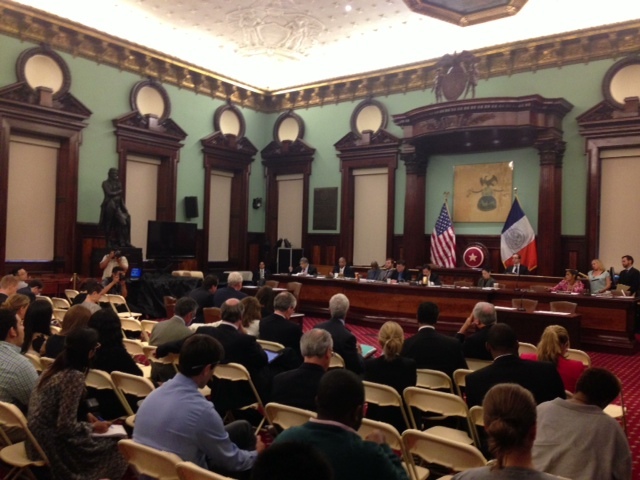 And even if the council, in all its regal glory, had decided to hold multiple hearings, could one have actually thought it would have been proper to also hold them in the outer boroughs and at night so the overtaxed New Yorkers in one of the priciest cities in los EstadosUnidos might have actually had a chance to comment. Lo dudo! By the way, go to my councilwoman’s web site. Click on the news section. That’s right. No mention of the pay raise. Councilwoman Koslowitz is an integral part of the Austin Street/Queens County Democratic party. It is a party that has run this county seemingly forever and whose members have included the venal State Senator Malcolm Smith, who tried to steal a mayoral nomination, convicted of fraud and extortion, among other things. Smith’s colleague included state senator Shirley Huntley, who set up a fake charity, then turned informer so she could get a lighter sentence. The venal Huntley, before she was sent to the slammer, had actually served on the state Senate’s government operations committee, which gives you a taste of how we do things in New York. But these putrid pols, overpaid and underworked, do sometimes earn their considerable pay by occasionally providing comedy relief. The Queens County Democratic organization also gave us the delightful Congressman Anthony Weiner, the career pol who used the net to send out millions of pictures of his “equipment.” He is a poster boy for this organization that never loses and even retains the loyalty of many voters even after their dirty linen is aired (Right up to the end of his term, Weiner was still popular with his constituents. He only resigned because of pressure from the national party. And rumors abound that this Milton Berle of the county organization will try for a comeback one of these days). Weiner and countless other pols are or were all members in good standing of what some here in Queens would consider a gang of pirates who never have to fly the Jolly Roger. That’s because they are navy, the coast guard and the sheriff—they are people who govern us even if many of them end up making license plates and dreaming about their next appearance before the parole board. There’s the infamous Alan Hevesi—the “good government” academic from Forest Hills—one of our leading neighborhoods—who later became state controller. He committed two felonies and was finally sent to the hoosegow. That’s even though the goose stepping voters had just re-elected him though everyone in the state knew he was under investigation and in serious trouble. And there was the once bright star of the Queens County organization, the man who was supposedly going to do great things not only for the county and eventually the whole state: Queens borough president Donald Manes. Manes was the 1980s Queens version of Boss Tweed. Manes was a venal public official once mentioned as a possible gubernatorial candidate. Considering that the former speaker and state senate majority leader of the New York state legislature are now headed for the caboose, it is a shame that Donald Manes never was elected to statewide office. He would have fitted in perfectly with the “steal everything not nailed down,” Black Horse Calvary of Albany. And if we had had a Governor Manes, think of all the Austin Street pols who would have lived large thanks to “Donnie,” as he was affectionately called by his fellow pols. But let us be fair to the departed Manes. He was never convicted of anything. Manes committed suicide as the prosecutors were closing in on him. But the Queens County Democratic organization never missed a beat. Even when its leader—Manes ran the organization as well as serving as borough president, an otiose position that most pols continue to use to this day as a stepping stone to higher office—slit his wrists, the organization went on and on like a rare strain of a venereal disease that is resistant to any medicine. The county organization—post-Manes, post-Hevesi, post God knows what else—continues to elect its favored sons and daughters to every office it can grab in a de facto one party county. I don’t exaggerate. It holds ridiculous elections that are all but predetermined. Still, the voters are urged to go to the polls and play their parts in these farces. Hevesi’s son, without even a college diploma, was elected to a state Assembly in a special election that was a joke. We even had a recent county district attorney race in which the republicans gave their nomination to a career democrat. That’s when Queens residents were recently given an unforgettable Soviet style election. It was an election in which longtime district attorney Richard Brown ran against Richard Brown and Richard Brown. No, that wasn’t a mistake. Brown had three lines, running against himself because he had no opposition! (In a Kafkaesque development, he even issued an election night statement thanking the voters for the vote of confidence. What vote of confidence? No one was running against him! When Brown babbled about his victory, who had he defeated? In Kafka’s “The Trial,” a man is put on trial and has no idea what the charges are against him. By the way, even in Orwell’s great “1984” Big Brother arranged for an opponent, the phony Goldstein who ran in a fixed election. Often we even don’t get an opponent, phony or real, in our faux Queens County elections). Nevertheless, Brown’s spokesman politely and patiently explained to me—a benighted Bunkerland Babbitt who doesn’t understand how my ruling class is working for me day and night—that the unopposed re-election was a good thing. A good thing? De veras, senor? But what’s bizarre about the Queens County Democratic Party? It is working night and day to re-educate me and others in the “virtues” of one-party government. It’s a one party county here in Queens in part because the republicans—the “supposed” opposition looking to turn the tables on the Austin Street democratic gang— spend much of their time fighting with each other. The republicans have their problems so they are usually happy to accept a few crumbs bestowed by the “We Own Queens County Now and Forever” Democrats. The ruling democrats hold court in a small office over a supermarket on Austin Street in downtown Forest Hills (Every time I pass it, I look up and clutch my wallet and think that my wife, the ever comely Suzanne Hall, and I should send our valuables under to Switzerland (There tax increases must be voted on by the people in referendum. Imagine that!). I think of how many of my neighbors have fled the outrageous spending and taxes of our piggy hired help here and in Manhattan, Albany and D.C., where the Potomac Poloniuses never tire of spending money and raising taxes. These career politicians from both parties believe their place on the public payroll must be forever; that the government must always spend more and more. Most of these career pols should be sent to a Jenny Craig camp for compulsive overspenders. Speaking of overspenders, has my councilwoman ever uttered a word about high taxes in this city? Has she ever shown the slightest independence of the county organization or the ruling council leadership? Karen Koslowitz’s most important career accomplishment is that she is a faithful member of the Austin Street organization. She went along with the majority who voted themselves a big raise and didn’t defer the raise until the voters had a chance to review it at the next election (The raise went into effect retroactively to January 1. Tell that to the millions of people who haven’t had a raise in a long while, retroactive or otherwise). The city council decided, with seven dissenters, to ignore a commission recommendation on the pay raise. The commission had been set up to prevent a conflict of interest. The council ignored it and voted for a bigger increase. So what was the point of the commission? The rationale for ignoring it was our starving council members hadn’t had a raise in some 10 years. The better pay would help them live with higher ethical standards (“The citizens have to pay for ethical lawmakers?” I asked). “The councilwoman is working 60 hours a week,” Cohen complained as my eyes quickly started to fill in and my knees went wobbly and I began to think of ways to nominate our own wonderful Queens Teresa of Avila for the first opening in the Blessed Trinity. Still, I quickly dried my eyes and noted that lots of people I know work 60 hours a week, get a lot less than our municipal Catos. They will never have the chance to vote themselves 32 percent raises, then quickly change the subject. I also wondered how much of that 60 hours is spent working on constituent matters and how much of it relates to the political monkey business conducted over the supermarket on Austin Street. Cohen assured me that the political component of that 60 hours was very small. He also told me that he would call me back and supply figures showing that council pay and the recent pay raise are not excessive. He never kept his promise. That’s because the more things change, the more they stay the same in New York City and Queens County. Almost a century ago, the sage of Baltimore, H.L. Mencken, wrote words that resound whenever I walk Austin Street in Forest Hills or read about the latest hijinks of the New York City Council or the New York State Legislature or think about what will happen when Congress is in session and starts “raising revenue” or a presidential candidate makes outrageous promises on the hustings.